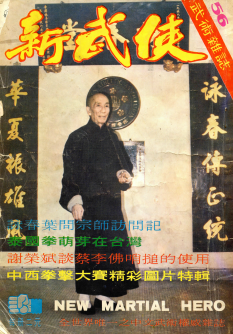 To introduce the art of Wing Chun, I have conducted a special interview with Master Yip Man. The 76-year-old is still in his physical prime; he is sharp, energetic, and offered a response to every single one of my questions. I have learnt much from this interview. Those who are avid readers of martial arts novels are surely familiar with the story of “Fong Sai Yuk” challenges the defender of the ring”. One of the most notable characters in the story is the monk Zhi Sin; the nun Ng Mui trained under the same master as Zhi Sin, and she was actually proclaimed as the founder of Wing Chun. Looking back, this story takes us back some two hundred years. If Wing Chun was founded by a woman, surely the style will be notably smoother and more subdued. Contrary to such popular belief, however, Wing Chun is actually much more aggressive than other martial arts styles. This stemmed from the fact that the founder is a woman, whose stamina is no match if she opposes a man in a fight; if she is not able to take down him down right at the start of the match, it will be impossible for her to continue on. Along that same tangent, the first rule of Wing Chun is therefore focused on aggression and speed; one must be able to inflict harm on an enemy at the wave of a hand, so that the enemy will know that he must retreat. Wu Mei passed on her skills to yet another woman, whose name gave birth to this particular school of martial arts. Her name was Yim Wing Chun, and she then taught what she had learned to her husband, Leung Bac Chou. When it was Leung’s turn to teach his disciples, since the art itself was yet to be named, Leung named it in memory of his wife and aptly called it Wing Chun. Wong Wa Bo, one of Leung’s student and who worked in a performance troop, then taught the art to Leung Yi Tai. Yi Tai then taught Leung Zan. We all now familiar with the fact that Leung Zan rose to fame in the city of Foshan (in the province of Guangdong, China). His star disciple, Chan Wa Shun (whose nickname was “Loose change Wa”), eventually became the Master of Master Yip Man himself. Chan operated his martial arts school for thirty-two years, but only taught sixteen disciples; Yip Man was the last of his students. Yip Man is presently 76 years of age. He started practicing Chinese martial arts at thirteen years of age, and moved to Hong Kong from Mainland China in 1949. Few residents of Hong Kong knew of Wing Chun back then; after twenty-three years of hard work, the result of Yip Man’s work is now visible. Master Yip has stopped taking on new students years ago. Leung Ting, an instructor who hosts Wing Chun classes in various schools such as Baptist College, Zhuhai College and Chinese Baptist Student centre is one of the last of his closed-door students. When talking to Master Yip Man, it was clear that he acted nothing like his age. He spoke with a clear, strong voice, and was not at all boastful. To satisfy our readers’ curiosity, I asked Master Yip to speak of his heroic acts back in the day, but was curtly refused. Master Yip was not willing to boast about his past, which frankly was a lost on our part. From what I had heard, however, Master Yip is known for two major acts back in the city of Foshan. Many residents back then were well aware of the tale. It was said that the master, in the prime of his hot-headed youth, had an argument with a military officer while attending a Piaose event (“Parade of Children’s Float”). The officer took out a pistol and pointed it at Yip Man, all the while attempting to shoot him. Seeing the danger in front of him, Yip lunged forward and grabbed hold of the pistol. He then gave it a strong shove and the barrel actually broke under his force. It hit the ground and had everyone at the scene utterly shocked. To this story, Master Yip’s explanation was that the axis within the barrel was already a bit loose, and it was no thicker than a toothpick. For this reason he could easily dismantle the part with force, and that this incident should really be heard with a grain of salt. He was being very modest indeed. In Master Yips school I saw an oddly-shaped wooden post. the post is surrounded by a square frame, and on the post three planks are affixed horizontally. Under the actual post a crooked piece of plank can be seen. I asked what this structure is all about and was told that this is the Muk Yan Jong (木人樁)(“wooden dummy”). The four planks act as the four limbs of the human body ; when practicing, fists or kicks land on these “limbs” to simulate an actual fight. To start practicing Wing Chun implies practicing “routines” or forms. The most basic routine is Siu Lim Tao (小念頭) (“little idea/thought”), and it’s the start to all training. It is then followed by Chum Kiu (尋橋) (“search for the bridge”), an intermediate routine which focuses on sidelong and shoulder close-range attacks. The last routine is Biu Jee (鏢指) (“darting fingers”), the most advanced routine of all. One fixates itself to the ground by spreading legs to a bit less than shoulder width and then sits down on an “invisible chair”. This form takes up little space, but the tip of the toes of both feet turn inwards, which marks its uniqueness in pose. This is to accompany routines which do not require lots of jumping, but ones where one glides along the ground. However, while the limbs are focused on “gliding”, one is able to firmly root itself to the ground and do not appear to be afloat. Chi Sao (詠春) (“sticking hands”) is one of the key learning to practicing Wing Chun. Chi Sao is useful for a variety of reasons; other than strengthening and one’s elbow and increasing its stamina in attacks, one can also use it to train oneself in defensive moves. These are inclusive of freestyle boxing moves. Chi Sao is, in essence, key to any self-defense practice! When we speak of the variety of routines Wing Chun, we are essentially looking at three forms: Fuk Sao, Tan Sao and Bong Sao. Compared to your regular martial arts routine (“punches and kicks”), you are essentially looking at three types of defense acts. According to Master Yip, these three routines have merged all of the multiple formations of Wing Chun within. Essentially, all of Wing Chun’s movements are combinations of three types of movements made by the arms, the flipping of the forearm, and the lowering of arms. Regular defense moves used in other martial arts routines are typically characterized by the move where, when someone throws a punch at you or delivers a kick, one defends oneself by blocking the move with one arm, and then striking back with the other arm or using both legs to launch an attack. In terms of the order of movement, the blockage always occurs before the actual attack; similarly, the defense and the attack usually cannot occur at the same time. Wing Chun, on the other hand, is entirely different; when one faces a punch, upon receiving that punch, a Wing Chun practitioner is able to attack at the same time. Simultaneous dissolution of an attack, or turning an oncoming attack into a defense, is the most unique concept of Wing Chun. This effectively calls for the slogan (in memorizing and practicing the move), whereby “an attack is a defense”. Master Yip Man demonstrates Tan Sao, Fuk Sao and Bong Sao during the interview. The person whose back is facing the camera is his student, Leung Ting. One more thing to note is the concept of “centerline”. What does it entail, exactly? Master Yip mentions that all moves targets the “core center”; in other words, turning one’s “bridge hands” into a core, so that when an opponent strikes, one is too always ensure that their bridging hands are outside of one’s own bridging hands, so that you may hang onto the advantage of being able to both attack and defend. Citing an example, Master Yip says that “all punches thrown are in a rectangular shape, resembling the Chinese character for the sun; we start from the heart and throws a straight-lined punch, acting in the form of the string on a bow. If the opponent throws a punch in the form of a hook or a hyperbole, that attack comes in the formation of a curve, much like the shape of the actual handle on a bow. We call these moves “riding along the bow” (anyone with a slight understanding of algebra will know that the curved line is longer than the straight line). Simultaneously, even compared to a straight punch that starts from the waistline, Wing Chun’s version is still of a shorter distance; therefore, all of our punches move strictly from the area near the heart“. Other than using the example of a string and a bow to illustrate this example in Wing Chun movements, Master Yip also talked of Wing Chun as “bamboo” and “hammer”. In theory, a bamboo stick, a hammer and a bow string have nothing in common and are not comparable. However, what makes Wing Chun indicative of a bamboo stick is that when the opponent strikes close, if one uses Tan Sao, Fuk Sao or Bong Sao to receive the attack, that actual strike will be as if hitting on a bamboo stick – one’s defence will, at that moment of attack, becomes pushed back as a result of the force, just like bamboo. When that strike retreats, however, one immediately strikes back at top speed, much like a bamboo stick will bounce back after with great force. In terms of the example concerning a “hammer”, this is speaking of the way one exerts force in Wing Chun movements. The force exerted should be exactly like the way one strikes a hammer into the wall. Everyone who has used a hammer to hit a nail knows that if you struck it with brute force, not only does the nail fail to penetrate the wall, it might actually becomes deformed. One must strike the nail cautiously, using the wrist as an axis and lightly hammering it in. This is what Wing Chun is all about. Many of you might think now that Wing Chun is all about “softness”, with the focus on using flexibility and softness to overcome strength. I posed this very same question to Master Yip. + Master Yip Man and his student Leung Tin demonstrate Fuk Sao; when the opponent attacks with a punch, Master Yip firmly blocks the attack with Fuk Sao, then dissolute the attack and moves forward with an attack of his own, all of which aptly captured by the force of the opponent’s attack. + Master Yip holds onto the opponent’s wrist, and immediately raises his right leg for a kick aimed at the small of the opponent’s stomach. Master Yip replied: “Wing Chun is in some sense a “soft” school of martial arts. However, if one equates that work as weak or without strength, then they are dead wrong. Chi Sao in Wing Chun is to maintain one’s flexibility and softness, all the while keeping in the strength to fight back, much like the flexible nature of bamboo“. Master Yip then mentioned the slogan used in Wing Chun – “keeping in the incoming strike, sending away the strike-back; drop it all and go straight ahead“. He then points out that the use of Tan Sao, Fuk Sao, Bong Sao is not about pushing a move to the side or moving one’s arms back and forth between the right and the left. “Sending away” refers simply to sending one’s move forward; “going straight ahead” refers to, well, moving ahead, and “keeping it in” simply means receiving and elbowing onto the opponent’s punch, instead of pushing away that attack with sheer force. Many individuals who are familiar with boxing have told me that these days crimes are on the rise. When you are on a flight of stairs you might run into robbers who grab you from behind; in public washrooms no one is immune from robbery. Likewise in restaurants, one look in the wrong direction might leave you beat up and bruised at the hands of gang members. In tight spaces as these, nothing works better to defend oneself than practicing Wing Chun. I believe that there’s more than an ounce of truth to this declaration. With the various schools in the field of martial arts, each one boasts of an unique edge; some are more about attacks, some are particularly well-suited for defense. Some have simpler movements, some have complicated ones. Some schools require a large amount of space so you can hone your skills, but some are particularly well-suited to tight spaces. Wing Chun definitely falls into the latter category. When asked this question, Master Yip’s response was “to each his own“. Other than fists, Wing Chun also has the Luk Dim Boon Kwun (六點半棍)(“6.5 point pole”) and the Baat Jaam Do (八斬刀) (“Eight slash sword”). Before moving onto practicing Wing Chun with weapon, one must first learn the pole squat, then move onto nailing the pole onto the ground. It then moves onto closing in the poles, as well as darting, closing in and firing the pole. After all these moves one then is qualified to learn the actual routine. As for the Eight slash sword, its core concept comes from fists routines. Another thing worth mentioning is that another martial arts school, the school of Yong Chun (永春)(Weng Chun) is also very apt at using the 6.5 point pole, but the moves are entirely different. Additionally, the dialect spoken in the Foshan area pronounces “Yong” and “Wing” as the same, which has led to many’s confusion and believing that these two schools are one and the same. Master Yip Man and his student Leung Tin demonstrate Fuk Sao; when the opponent attacks with a punch, Master Yip firmly blocks the attack with Fuk Sao, then dissolute the attack and moves forward with an attack of his own, all of which aptly captured by the force of the opponent’s attack. Master Yip holds onto the opponent’s wrist, and immediately raises his right leg for a kick aimed at the small of the opponent’s stomach.